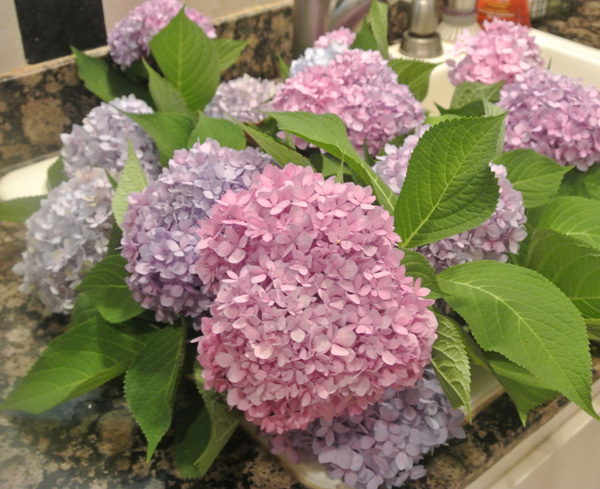 fresh from the garden I put them in my sink filled with cool water to keep them happy. Some are pink and some are blue and some are lavender. Next year I’m going to play with changing the acidity of the soil to see if I can get deeper color…any suggestions? Doesn’t really matter to me, I LOVE them no matter what color! 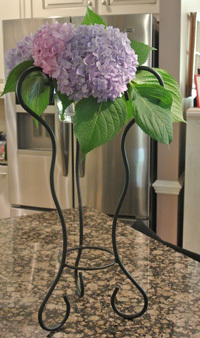 This is my favorite hydrangea vase, a simple iron stand with a small glass bowl on top. 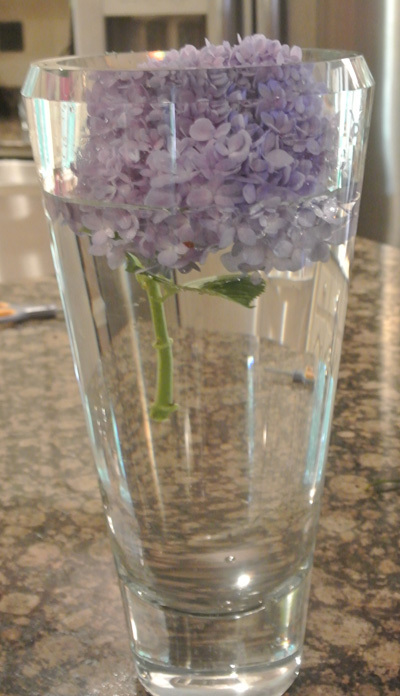 It looks stunning with 4-5 blooms floating in it and that is what is usually centered on my island all summer. This is an arrangement DD [darling daughter] and I created for her patio. 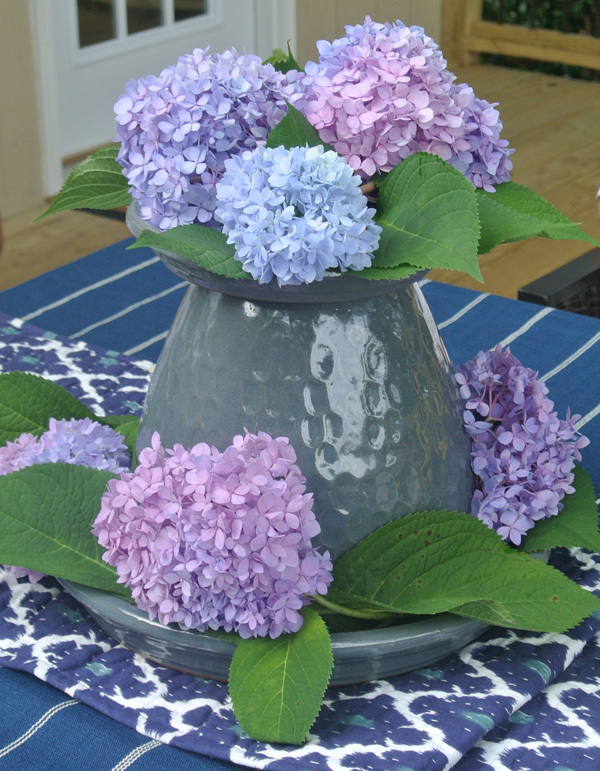 We found this great gray pot at Home Depot and inverted it onto a larger gray saucer base, and topped it with a smaller pot saucer. 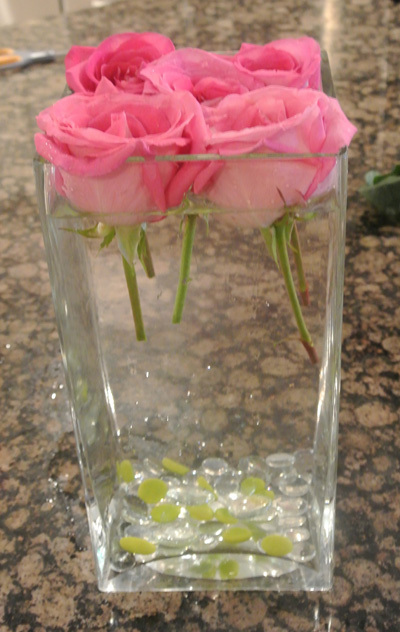 The saucers were deep enough to hold water for the blooms to float in. 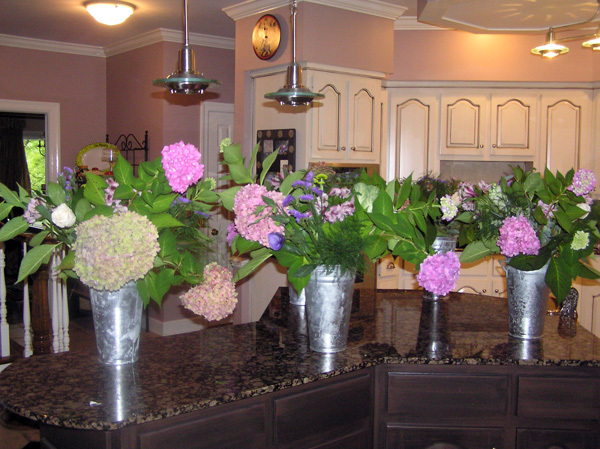 We used a total of about 9 blooms. It looked great and we spent about $15! 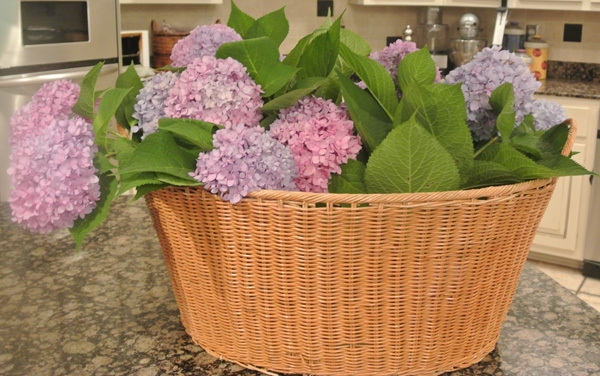 I also love to put hydrangeas in these french flower buckets. 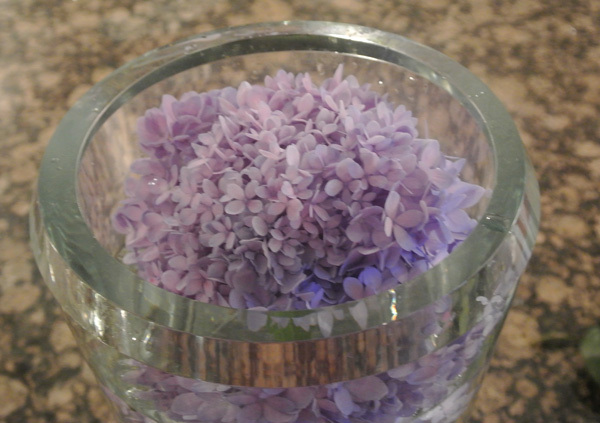 Each bucket needs only about 3-4 blooms if you keep the stems with leaves on and they make dramatic centerpieces or party decor. 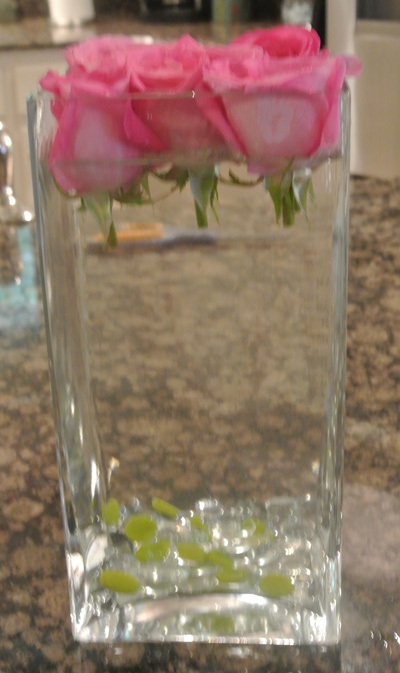 Here are some roses that I floated in a large vase with some glass beads in the bottom. 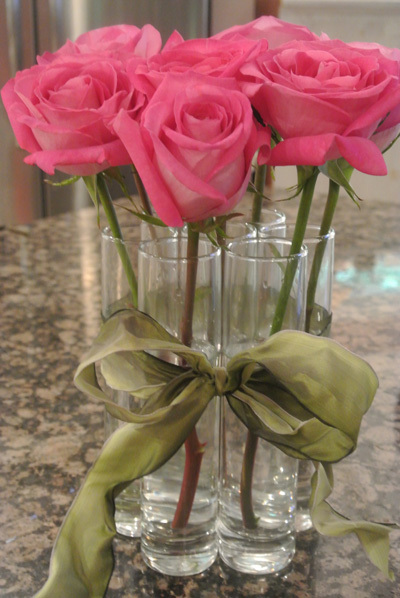 The green beads pull color from the flower stems to ground the arrangement. 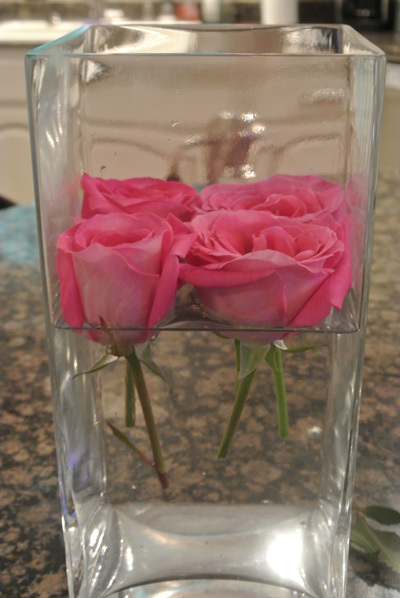 This is a BIG square vase but only 5 rose blooms floating on the water surface filled the space. 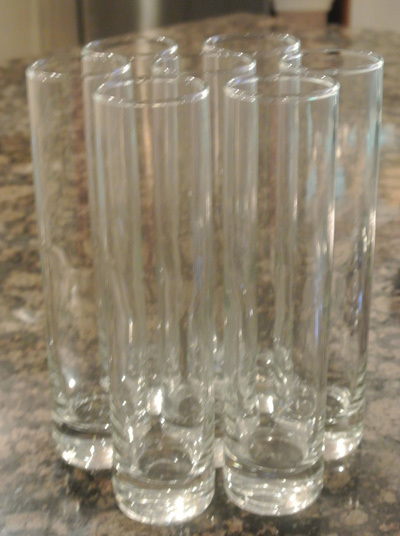 Experiment with the amount of water you use, different heights make interesting looks. 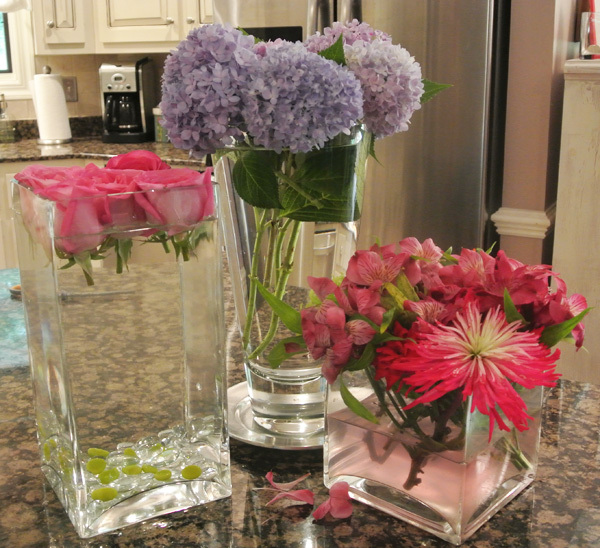 Here’s the same vase but notice I cut the stems shorter and lowered the water level so the blooms are barely above the edge of the glass. View from the top, these blooms had opened so much I only needed 4 to fill the space! So pretty! 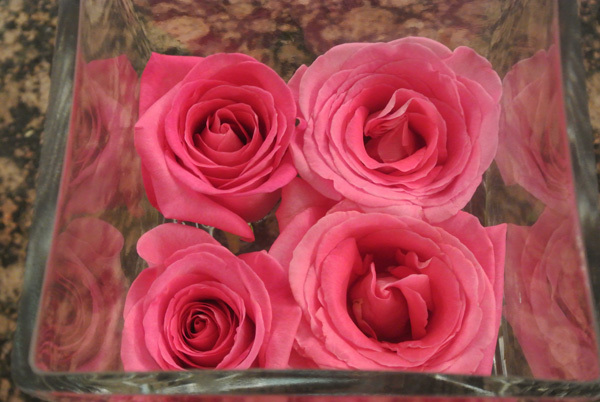 By the way, these roses came in a $8.99 bunch from the grocery store that HH brought home the other day [he’s sweet like that]. 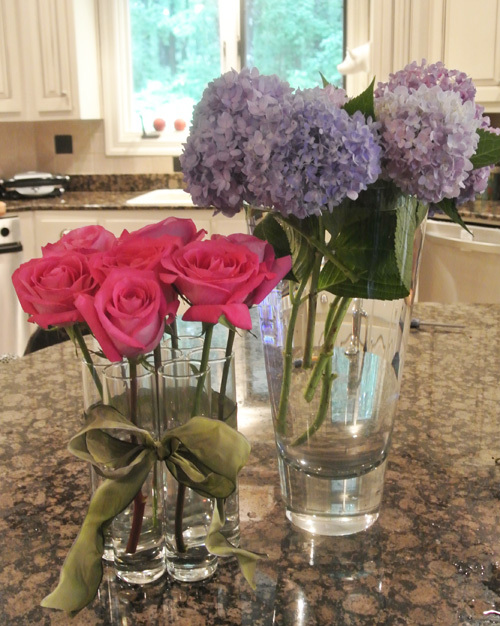 So you don’t have to spend a lot of $$ to have fresh flowers around. 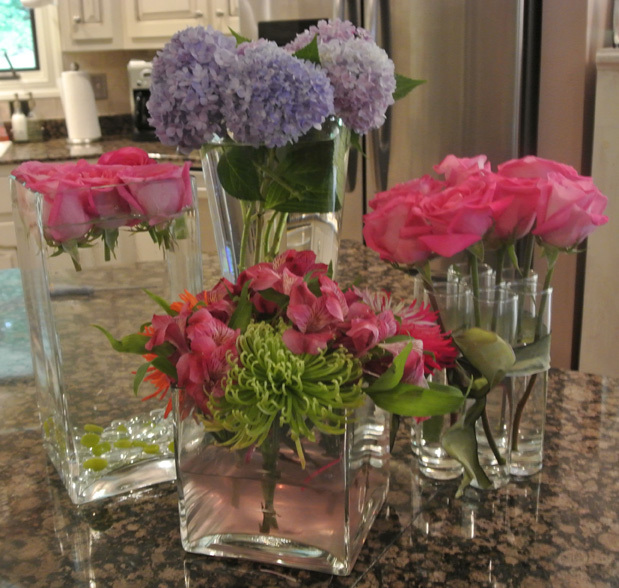 Just use a little imagination to make a few blooms go a long way.